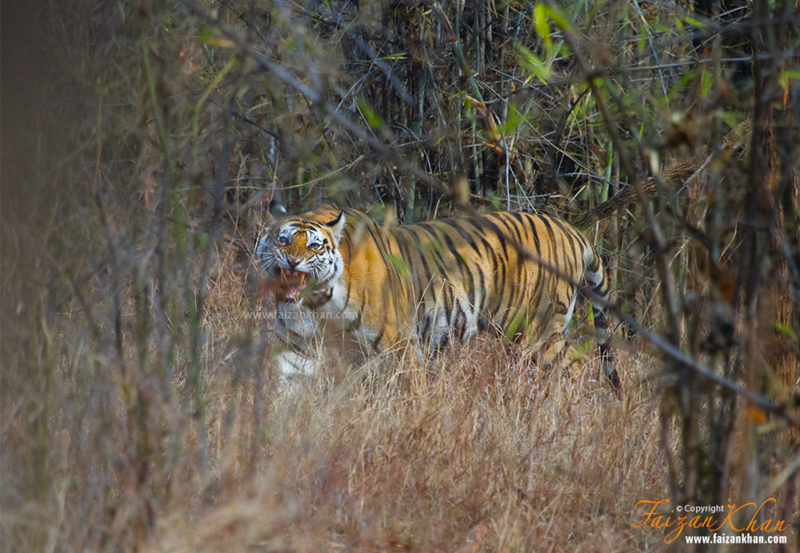 These photos are from one of the very interesting tiger sighting and experience I had in Bandhavgarh. It was an unplanned tour in March 2016. I had some work in Jabalpur and co-incidentally Akash (My co-traveler, Friend, Photographer and Wildlife Tour Operator) also had some work in Bandhavgarh. Eventually, we decided to try and get current Safari bookings or get into the buffer zones. 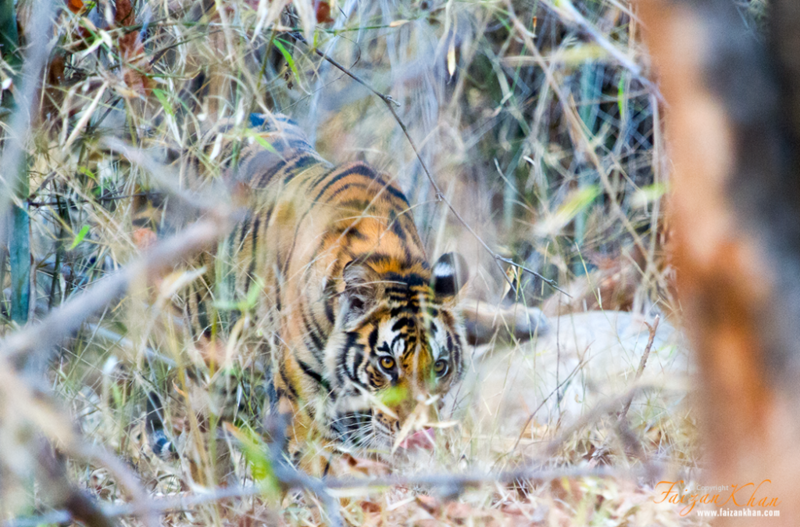 Luckily we got an evening Safari in Khitauli Zone of Bandhavgarh. It was a beautiful evening there were heavy rains a day before. We were enjoying nice breeze and scenic beauty of the Jungle. But no signs of Tiger, couldn’t find any Pugmarks, alarm calls. We decided to try our luck on different waterholes in the first hour of our ride. Then we took the route to the “Nigah Naala” road. Akash prefers to stand on the rear seat of the gypsy to hear calls and look around if there’s any movement. He noticed some fresh cow dung on the road & we started discussing how a cow can enter in the Core area of jungle. “Roko roko, peechhay lo” (stop the gypsy & take it back), Akash screamed, he saw something on our left side deep in the foliage. The driver reversed the gypsy. We tried to find what he spotted but we failed. Akash pointed out some white thing inside the foliage. It was a cow carcass and probably the same cow, whose fresh dung we saw on the road few minutes back. Akash and Dinnu Bhaiya, (our driver) identified the cow. Both of them informed us about the territory of “Nigah Naala” tigress, she must have killed the cow and left it here to fetch her cubs from the hidings. We decided to check the area where Nigah Naala and her cubs spotted a day before. When we reached that spot 4-5 gypsies with tourists were already there and they told us about some growling they just heard. 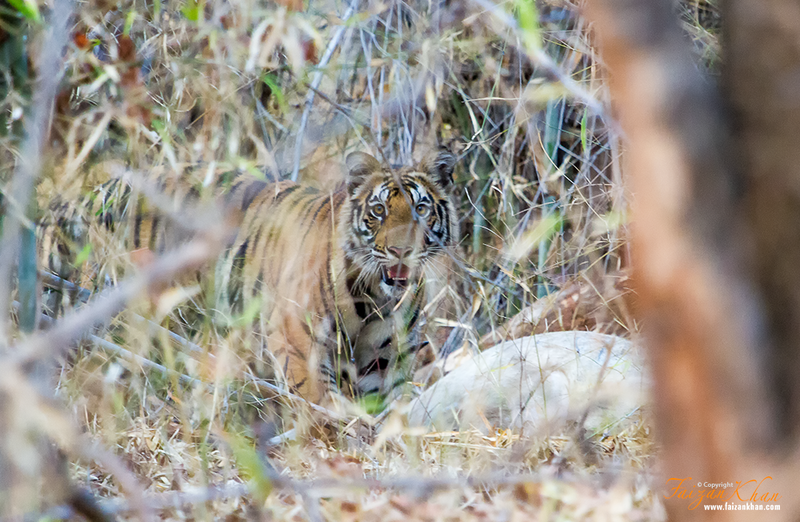 Dinnu bhaiyya the driver informed us it was a sound/growl by the same tigress to call her cubs to take them to the kill. Now we were 100% sure that we gonna see a tigress and her cubs in the next few minutes. Akash and Dinnu Bhaiya decided to check a waterhole situated on the route which the tigress was supposed to take to bring cubs to the Kill. 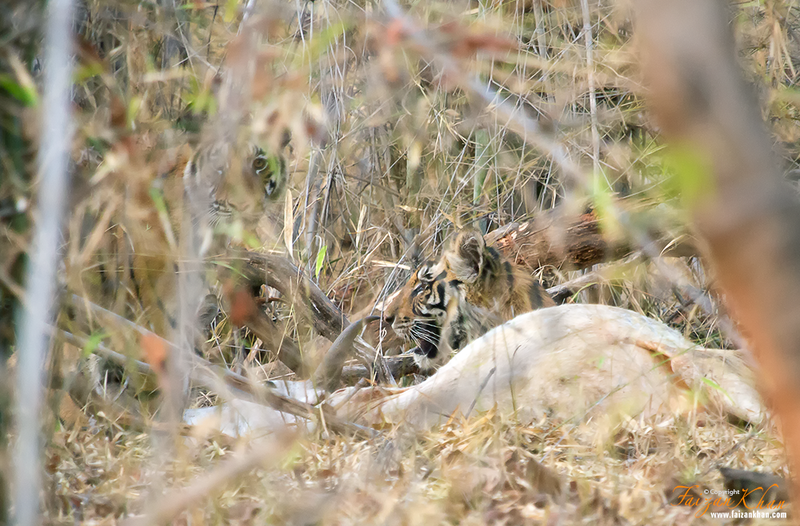 But there was no movement on the waterhole, Akash told us that we got little late and tigress has left waterhole already and now we will see her with cubs on the carcass. 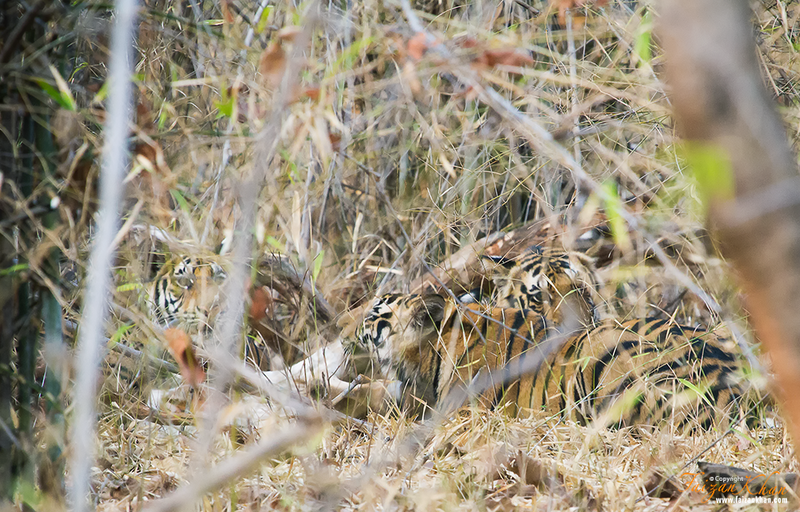 Then we reached the spot, parked our vehicle and within 2 minutes cubs started to emerge from the thickets one by one. We saw the same family in the next morning safari as well. Previous articleLearning is fun ! Learning Fashion PhotographyNext article Nature never ceases to amaze us...! Superb Article, well narrated while I visualised myself in the situation. Thank you so much Gajendra !